While hurrying towards a rescue mission, the Enterprise is interrupted by Q, who offers to give Riker the power of the Q Continuum. I like how Q is turned up to 11 in terms of playfulness and craziness. I also like how he's developing an animosity with Worf. It's strange that we're ten episodes in and we still know basically nothing about Worf or what has happened to the Klingons in the 24th Century. Now Q quotes Shakespeare to Picard. 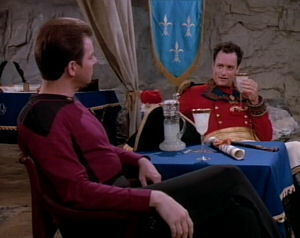 Picard: "Oh, I know Hamlet." Love it! That whole scene is awesome. Poor Worf. All he wants is a battle, and he keeps getting denied it. The power of the Q = the best superpower of them all. You can basically do anything. It also makes you a little nuts, apparently. Picard already has a lot of faith in his first officer. Data can throw around those huge chunks of concrete like they're made of painted styrofoam. Grown up Wesley is an even bigger douche than young Wesley. Why is everybody hitting on Yar in this episode (even the Klingon woman)? Is it because Troi's not around? What is that strange grid Q sets up in space? How come we never see it again? When Q describes the Q Continuum, I can't help but think of the ridiculously disappointing VOY episode in which we finally get to see it. Oh, how I wish they'd left it up to our imagination. Data quotes Shakespeare: "to thine own self be true." Later, there will be a Data-heavy episode named after that very same quote, "Thine Own Self."